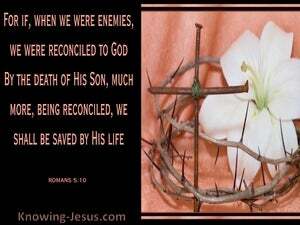 ﻿ Romans 5:10 For if when we were enemies, we were reconciled to God by the death of his Son; much more, being reconciled, we shall be saved by his life. 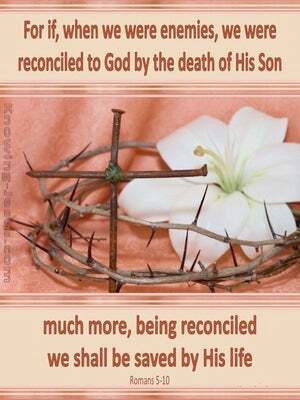 For if, while we were enemies, we were reconciled to God through the death of his Son, how much more, having been reconciled, will we be saved by his life! 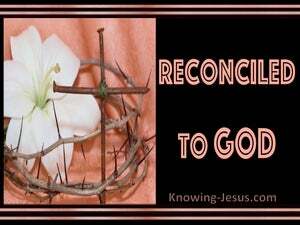 For if, while being enemies, we were reconciled to God through the death of his Son, much more having been reconciled we will be saved by his life. 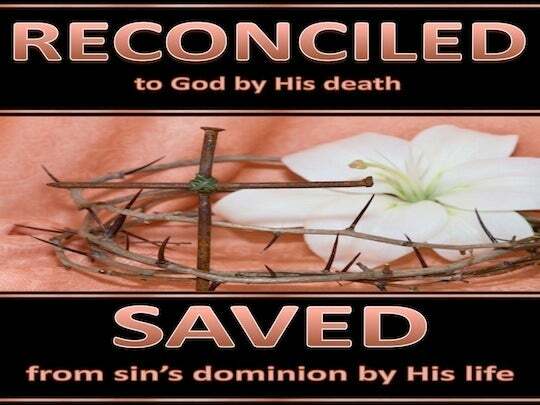 For if while we were enemies we were reconciled to God through the death of His Son, it is much more [certain], now that we are reconciled, that we shall be saved (daily delivered from sin's dominion) through His [ resurrection] life. For if while we were [God's] enemies, we were restored to fellowship with Him through the death of His Son, now that we have been restored, how much more [certainly] will we be saved [from condemnation] by His life! For if, while we were enemies, we were reconciled to God by the death of his Son, much more, having been reconciled, shall we be saved by his life. For if, when we were enemies, we were reconciled to God through the death of his Son, much more, having been reconciled, shall we be saved by his life. for if, when we were enemies, we were reconciled to God by the death of his son: much more being reconciled, shall we be saved by his life. For if, being enemies, we have been reconciled to God through the death of his Son, much rather, having been reconciled, we shall be saved in the power of his life. If, when we were God's enemies, we were reconciled to him through the death of his Son, it is far more certain that now that we are reconciled we shall be saved through sharing in his life! For if, when we were enemies, we were reconciled to God by the death of his Son, much more being reconciled, we shall be saved through his life. For if, when we were enemies, we were reconciled with God by the death of his Son, much more, now reconciled, we shall be saved by his life. For if, being enemies, we were reconciled to God by the death of his Son, much more, reconciled, we shall be saved in his life. For if, [while we] were enemies, we were reconciled to God through the death of his Son, by much more, having been reconciled, we will be saved by his life. For if when we were enemies, we were reconciled to God through the death of His Son, much more, being reconciled, we shall be saved by His life. For if, when we were enemies, we were reconciled to God by the death of his son: much more, seeing we are reconciled, we shall be preserved by his life. If we were reconciled to God by the death of his Son when we were enemies, much more, now that we are reconciled, shall we be saved by his life. For if, when we were God's enemies, we were reconciled to him through the death of his Son, how much more, now that we are reconciled, shall we be saved in his life. For if while we were enemies we were reconciled to God through the death of his Son, how much more, since we have been reconciled, will we be saved by his life? For if, while we were enemies, we were reconciled to God through the death of his Son, much more, being reconciled, we will be saved by his life. 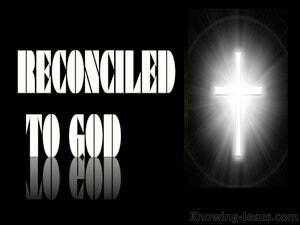 For if when enemies we were reconciled to God through the death of his Son, much more having become reconciled we shall be saved in his life. For, if being enemies we were reconciled unto God through the death of his Son, much more, having been reconciled, shall we be saved by his life. For if, being enemies, we have been reconciled to God by the death of his son, much more, having been reconciled, shall we be saved by his life. For if, when we were God's enemies, we were reconciled to him through the death of his Son, much more, now that we have become reconciled, shall we be saved by virtue of Christ's Life. For if while we were hostile to God we were reconciled to Him through the death of His Son, it is still more certain that now that we are reconciled, we shall obtain salvation through Christ's life. For if while we were God's enemies, we were reconciled to Him through the death of His Son, it is much more certain that since we have been reconciled we shall finally be saved through His new life. For if when we were enemies, we were reconciled to God by the death of his Son; much more being reconciled shall we be saved by his life. 9 Much more then, being now justified by his blood, we shall be saved from wrath through him. 10 For if when we were enemies, we were reconciled to God by the death of his Son; much more, being reconciled, we shall be saved by his life. 11 And not only so, but we also joy in God, through our Lord Jesus Christ, by whom we have now received the atonement. Always bearing about in the body the dying of the Lord Jesus, that the life also of Jesus may be made manifest in our body. Wherefore he is able also to save them to the uttermost that come to God by him, seeing he ever liveth to make intercession for them. And no sin-offering, of which any of the blood is brought into the tabernacle of the congregation to make reconciliation in the holy place, shall be eaten: it shall be burnt in the fire. And the priests killed them, and they made reconciliation with their blood upon the altar, to make an atonement for all Israel: for the king commanded that the burnt-offering and the sin-offering should be made for all Israel. And this is the will of him that sent me, that every one who seeth the Son, and believeth on him, may have everlasting life: and I will raise him up at the last day. And I give to them eternal life; and they shall never perish, neither shall any pluck them out of my hand. Who is he that condemneth? It is Christ that died, or rather that is risen again, who is even at the right hand of God, who also maketh intercession for us. I am he that liveth, and was dead; and behold, I am alive for evermore, Amen; and have the keys of hell and of death.